The QUERY LETTER and the story pitch it contains are your first—and most important—contact with an agent. 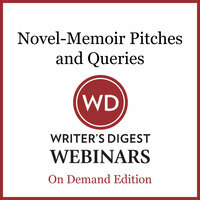 This is where you explain who you are, what the book is about, and why you've chosen to contact this literary rep. Because the query is such a big step on a writer's journey, this entire 90-minute webinar will be devoted to it—dissecting queries that worked and queries that didn't. Successfully pitching an agent or editor on your book concept takes brevity and power. Whether you're pitching at a live event, or in the context of a query letter, you must pique a literary agent with your book hook. Instructor Rachelle Gardner has read and critiqued thousands of queries, and will show attendees what elements in a query letter will get an agent to request more.